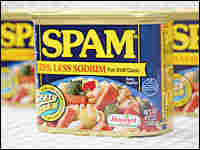 Spam: More than Junk Mail or Junk Meat Created by Hormel Foods in 1937 and promoted as "the miracle meat," Spam became K-ration fare for American GIs and Allied forces during World War II. The "war-time delicacy" is still a favorite in Howard Yoon's cupboard. He explains why. Created by Hormel Foods in 1937 and promoted as "the miracle meat," Spam became K-ration fare for American GIs and Allied forces during World War II. Former British Prime Minister Margaret Thatcher referred to it as a "war-time delicacy" and former Soviet Premier Nikita Khrushchev said it kept Russian troops alive against the Nazis. Readers, including NPR's Karen Grigsby Bates, share their Spam stories. Spam, eggs and kimchi was one of the author's mother's go-to dishes after a long day at work. Hawaiians love their Spam. Musubi, a ready-to-eat Spam snack that resembles a large piece of nigiri sushi, is one of their favorite ways to enjoy it. When Mr. Bun says he doesn't like Spam the Vikings break into their Spam song. The Spam Museum in Austin, Minn., features a video exhibit of the Monty Python sketch. Why? For one thing, Spam is too fatty (16 grams of fat, 6 grams of saturated fat, 180 calories per 2-ounce serving) and too salty (24 percent of the daily allowance of sodium) for today's health-conscious eater. It is, however, a pretty good source of Vitamin C. For foodie elitists, the processed flavor and mealy consistency put Spam near the bottom of the food ladder, as far away from, say, foie gras or white truffles as Paris Hilton is from a Mensa meeting. How is it, then, that this pink, gelatinous throwback to the 1930s has sold more than 6 billion cans — and is still selling strongly in the United States and abroad? Who is still eating this canned good that detractors have dubbed "Something Posing As Meat" or "Special Parts After Mutilation"? The answer might be: You. Try a can yourself. Don't be shy. Surely you've purchased more embarrassing things at the grocery store. If you've ever eaten a hot dog, you should be comfortable enough eating Spam. The ingredients are mainly pork shoulder and chicken (my motto: don't ask, don't tell). The meat is ground to a medium-course texture, with salt and sugar added for flavor (SPiced hAM, get it?). Nitrites help preserve the color. Then the mixture is mechanically filled into cans and cooked in an oven. When you open it, don't bother feasting first with your eyes and nose, as you do with other foods. Cut a few slices of Spam and fry them in a pan over medium-low heat. No need to add oil or fat, the pork has plenty of its own. Allow the slices to get slightly crispy, then flip over and repeat on the other side. Now we're in business. What you have in front of you is a beautiful thing: a universal ingredient that can add flavor and body to any dish. 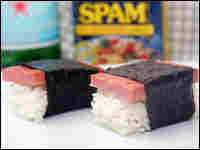 Spam is the Greatest Generation's version of tofu, a block of protein that can be sliced in patties, diced in cubes, or minced and chopped into fine pieces. The difference, however, is that tofu is bland and tasteless; it has to borrow the flavors of its fellow ingredients. 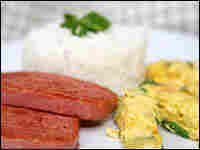 Spam, with its high fat and salt content, gives any meal an extra meaty World War II kick in the rear. Spam is the Paul Giamatti or John C. Reilly of the culinary world, an everyman food that lacks the charisma or looks of a leading ingredient, but consistently makes all other ingredients taste better. Add Spam to sandwiches or pizzas. Chop it up and use it in a casserole or on a salad. Use it to spruce up a dip or an appetizer. You can even put it in sushi rolls, which is the way Hawaiians like it best, and they eat more Spam than anyone else in the country. My personal favorite use of Spam comes from my Korean upbringing. My parents acquired a taste for Spam in the 1950s, when it was one of the few meats available on the black market during the Korean War. When they moved to the U.S. in the 1960s, they brought with them their love for Spam. On nights when my mother would get home late from work, my family would sit down to a plate of fried Spam slices, crispy on the edges, egg and scallion omelets, steaming white rice and piles of spicy kimchi, the Korean fermented cabbage that, like Spam, you either love or hate. In my family, you couldn't ask for a more satisfying meal than "Spam and Eggs." Still not feeling brave enough? Hormel offers plenty of variations of classic Spam to suit your taste. The list goes on and on, almost like the Monty Python sketch: Spam Less Sodium, Spam Garlic, Spam and Cheese, Spam with Bacon, Spam Spread, Spam Lite (which contains pork and chicken), Spam Hot and Spicy, Spam Hickory Smoked, and Spam Oven Roasted Turkey. 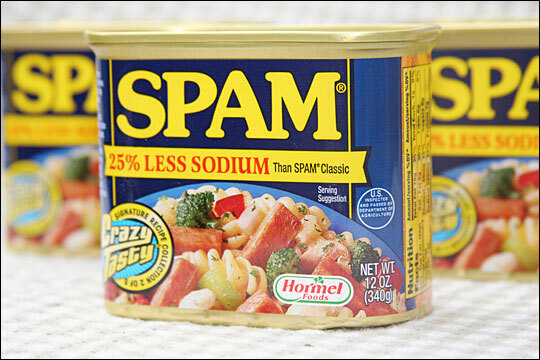 Hormel even released Spam "Golden Honey Grail" edition in honor of Spamalot, the Monty Python Broadway musical. 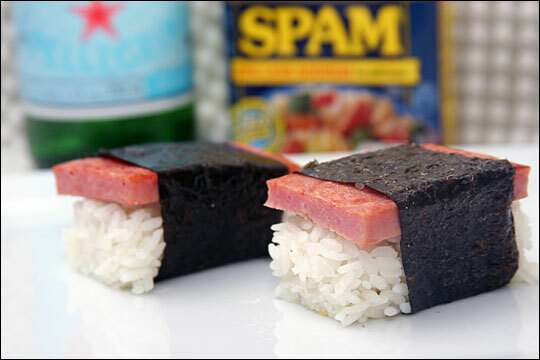 More Spam is consumed in Hawaii than any other state in the U.S. By far, Hawaiians' favorite dish is Musubi, a ready-to-eat Spam snack that resembles a large piece of nigiri sushi. In Hawaii, you can buy Musubi in nearly any convenience store or grocery store for between $1 and $2. This is adapted from a recipe on the Hormel Foods Web site. Slice Spam lengthwise into 8 equal pieces. In a shallow dish, combine garlic, ginger, brown sugar and soy sauce. Place Spam slices in the mixture and let sit for 30 minutes. Remove and pat dry. In a medium-sized skillet, fry the marinated Spam slices over medium heat, 2 minutes on each side or until lightly browned. Cut nori into 8-1/2 inch strips. Place Spam slices on rice blocks and wrap individual nori strips around each middle. Moisten one end of nori slightly to fasten together. The remaining marinade may be used as a dip. This is the dish my mom used to make whenever she ran out of time or ideas for what to cook for dinner. Kimchi is available at any Asian supermarket and now even at some larger grocery stores. Whisk eggs and scallions in a mixing bowl. In a skillet, fry the Spam slices over medium heat, 2 minutes on each side or until lightly browned. Remove Spam from skillet onto a paper towel or plate. Add oil to the same skillet, then pour in egg mixture. Fold over sides to form a long, flat tube shape. Salt and pepper to taste. Remove and slice into 2-inch wide strips. 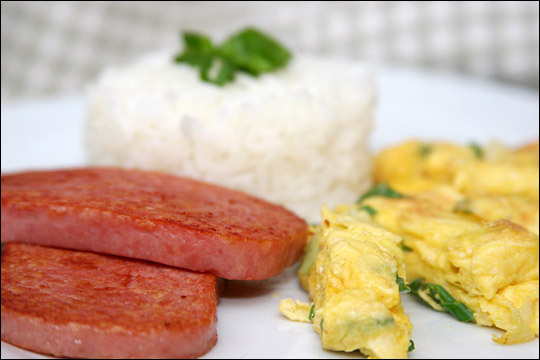 Serve Spam and eggs with a side of hot white rice and kimchi. Don't expect to earn your third Michelin star with this dish. But any diners who are also die-hard Monty Python fans will be delighted. Place lobster tails into large pot of boiling water. After 3 to 4 minutes, add shrimp. Cook another 3 to 4 minutes until lobster and shrimp are done. Remove from pot. Drain and rinse under cold water. Using kitchen shears or carefully with a knife, remove but save lobster shells. Cut lobster meat and shrimp coarsely into 1/2-inch pieces. Heat 4 tablespoons of butter in skillet over medium heat. Add onions and saute about 4 minutes, until translucent. Add flour and stir, cooking for another 1 to 2 minutes. Whisk in brandy, then hot cream. Remove from heat and add Gruyere and half the Parmesan cheese, stirring frequently. Add lobster, shrimp, paprika, salt and pepper. Arrange lobster shells in a casserole dish. Pour lobster shrimp mixture over shells and sprinkle with remaining Parmesan cheese and bread crumbs. Broil on high until golden, 3 to 5 minutes. While waiting for the dish to broil, slice Spam into 8 pieces. Fry eggs over medium heat, then remove. Fry Spam slices until light brown. To serve, place each lobster shell on a plate. Top with one or two slices of Spam and then a fried egg. Serve truffle pate on the side.